You know this image… social scientists and feminists love it. But do you know the story behind it? The image was created by American graphic artist. J. Howard Miller. Listverse reveals the interesting details behind its production. The image has been reappropriated by feminists to inspire women’s agency, but the poster was actually produced as pro-war propaganda in the USA during the 1940s. Most astounding of all is that the woman who inspired this poster, Geraldine Doyle, became aware of her role as muse for one of the most iconic representations of female empowerment FORTY YEARS after the fact! became a symbol for women who produced war supplies and took new jobs replacing the male workers who were in the military. 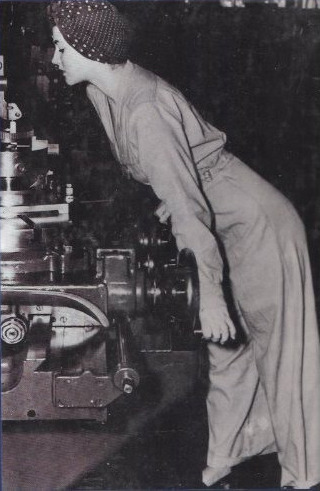 Miller based the “We Can Do It!” poster on a United Press International picture taken of Geraldine Doyle working at a factory. Ironically, Doyle only lasted two weeks on the job before quitting because she feared a hand injury would prevent her from playing her cello. The poster did not become widely known until the 1970s and 80s when it began to be used by advocates of women’s equality in the workplace. …Kimble and Olson question its lauded female empowerment message. Current readings of the poster as a feminist emblem assume this female worker is calling out to other women, inspiring them to leave their kitchens and join her on the factory floor. In fact, Westinghouse workers would have seen it in a different context, as just one of many similar posters displayed in the plant. When taken as just one in a series directed at workers, the collective “we” in “We can do it!” can’t be read as women, but allWestinghouse employees, who were used to seeing such statements posted in employeeaccess-only areas of the plant. Today, we see the poster through a lens shaped by what came later, particularly Second Wave feminism. The women’s rights movement of the 1960s and ‘70s fostered a genderbased form of identity politics in which women identified with each another as women and viewed themselves as sisters in a struggle against gender inequality (work was an explicit area of contention). Cultural perceptions of the 1950s as a period of particularly rigid gender roles contrasted with the apparent freedom briefly available to women duringWorldWar II. 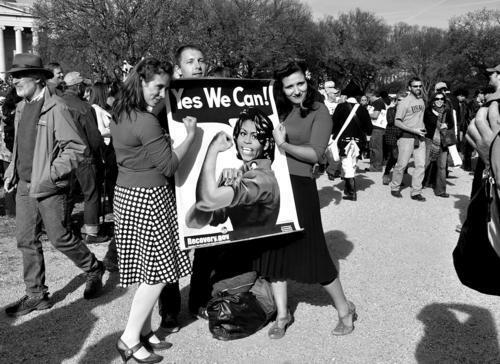 Within this context, now we look at the “We Can Do It!” poster and take for granted that “we” means other women. Yet Kimble and Olson remind us that this understanding isn’t an obvious interpretation, but the outcome of efforts to frame womanhood as a meaningful social identity—one that unites members through shared experience in a patriarchal society. Placing this poster in its original context illustrates theway in which historicalmyth-making has obscured its real role. Ironically, the iconic image thatwe nowimagine as an early example of girlpower marketing served not to empower women to leave the domestic sphere and join the paid workforce, but to contain labor unrest and discourage the growth of the labour movement. Poster image and quote via Listverse. Photo of Doyle via Awesome Stories. Wade published in Contexts, pdf via Lisa Wade.com.